It’s Zoey’s first collection…of books, that is! 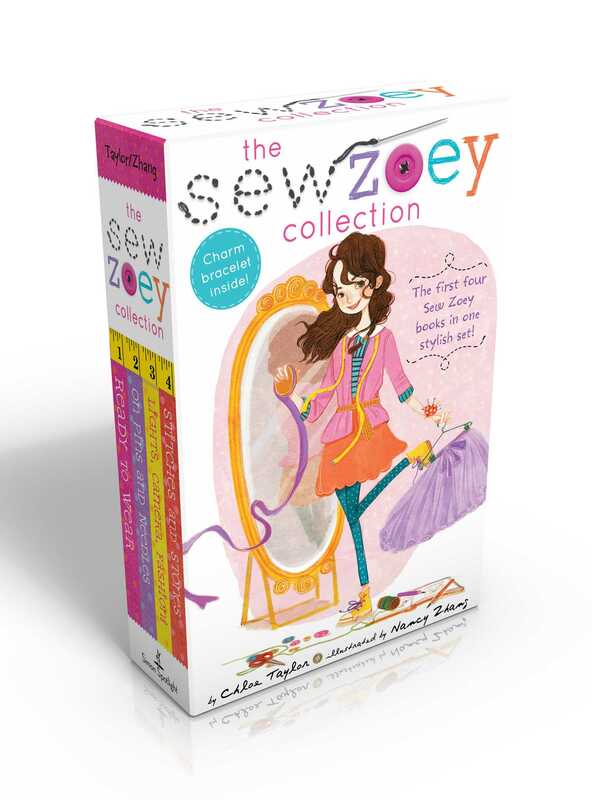 Collect the first four Sew Zoey books in this stylish boxed set that comes with a fashion-themed charm bracelet! Fashion’s a snap compared to middle school: Just ask Zoey Webber! When Zoey’s school gets rid of uniforms, it’s the best news ever for a girl who loves clothes. Then Zoey’s best friends, Kate and Priti, encourage her to sew her own clothes and start a fashion design blog! The Sew Zoey blog takes off, quickly putting Zoey on the A-list in the fashion world…but will things unravel at middle school? Whether she is teased or is a trendsetter, Zoey’s friends always help her remember to take things one stitch at a time! This deluxe boxed set includes Ready to Wear; On Pins and Needles; Lights, Camera, Fashion! ; Stitches and Stones; and a fashion-themed charm bracelet! Zoey is back and still sewing and blogging in the second book in this upbeat series . . . When she comes to the conclusion that she has to patch her friendships in the same way she patches her torn jeans, determined and creative Zoey reweaves both friendships and makes them stronger.